Starting from March 10, 2006 and continuing through until April 16, 2006 "Café de Chef" at the Sofitel Ambassador Seoul is featuring its special lobster menu for spring gourmets. This high-nutrition and tender lobster dish is full of protein but contains little oil and cholesterol, making it popular worldwide among dieters. The lobster dish is available yearlong but is believed to taste the best during spring and fall. 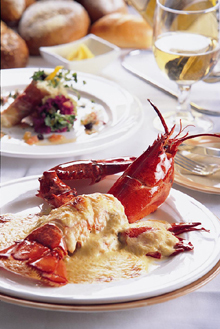 The restaurant features four types of set menus including the main dish, which guests can choose from a mouth-watering selection of steamed lobster with citruses butter sauce, broiled lobster with spicy coriander garlic sauce, deviled lobster on a spaghetti bed, newburg lobster on a bed of rice pilaf, or lobster thermidor on a garlic toats bed. During the promotion, a glass of Peregrine Riesling will be available at a special price of 7,900 won and guests born in the year of the dog will receive a 15 percent discount. A birthday cake and a glass of champagne will also be served for a birthday guest accompanied by three or more guests.